New post by Maddy Leger: "Using the New Xamarin.Forms Controls Toolbox"
I have the latest updates to VS 2017 15.8.1, I have xamarin forms 3.1 but the toolbox is empty, any ideas? Thanks! Hi there! Try right clicking on the toolbox surface, selecting "Reset Toolbox" (which should clear everything), and then close and reopen your Xamarin.Forms project in VS. The toolbox will only show items if you have a Xamarin.Forms XAML file open in the editor! Hmmmm. If you could file a bug (Help -> Send Feedback -> Report a Problem) we can try to look into it for you! Thanks! Awesome feature, that we needed it from a while in order to make it more easy mostly in training sessions. But my question is can we export our personalized controls? so we can add them on another computer or send them as a file? I found this worked if i have the toolbox pinned and opened a xaml file which was not already previously open in the editor. If i already had XAML windows opened in the editor then the toolbox items don't show until you close them down and reopen. Note: Additionall incase the above doesn't work i right clicked on the Toolbox window and selected "Choose Item" then the .net Componets tab took awhile to refresh but once this was showing components i closed and opened a new XAML view. @ncunning closing all xaml files then doing "Note: Additionall incase the above doesn't work i right clicked on the Toolbox window and selected "Choose Item" then the .net Componets tab took awhile to refresh but once this was showing components i closed and opened a new XAML view." did the trick. Thanks! Looks great! 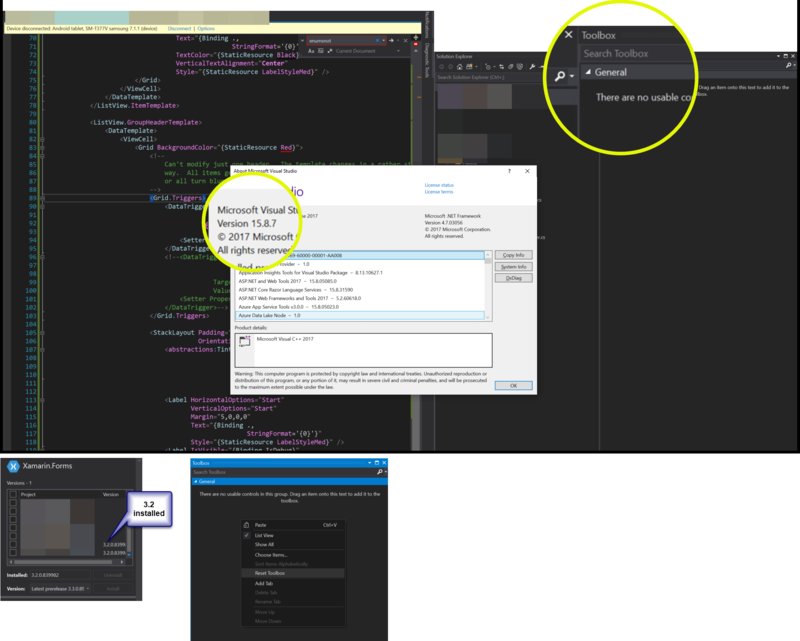 When can we expect the Properties Tool Window to work for XAML? Right now we don't support adding your own personalized controls to the toolbox. As far as sharing the control itself, custom controls are their own class, so they can be in their own XAML file which can then be shared. We're currently working on integrating this into Xamarin.Forms XAML - no release date yet, but it is in progress. Visual Studio 15.8.2, toolbox still empty. I tried @ncunning solution but not working. @verysimplenick I haven't seen this behavior yet on 15.9.0 Preview 2 - Could you go to Help -> Submit Feedback -> Report a Problem & submit through there? That way we can investigate the issue. Thanks! Hmmm. This shouldn't be happening after trying that solution - Could you go to Help -> Submit Feedback -> Report a Problem & submit through there? That way we can investigate the issue. Thanks! So you're saying you didn't actually choose any specific DLL's in the dialog? Just opening and waiting for it to reload (re-evaluate) all the things it is supposed to be using made a difference? Even after going through all the various suggestions... including having it pinned before opening a XAML doc... it doesn't work. yeah, I haven't actually used it though since I got it to work that one time. If the toolbox doesn't work for you & your issue isn't one of the two described above (custom page control or project in solution folder) then please add a comment on the above ticket that describes your scenario and we'll dig in. Thanks. Has there been any progress in supporting custom controls in the toolbox? An ETA would help. You know you can drag text to the toolbox, right? So if you lay out the XAML for one of your controls the way you typically place it, then select that XAML you can drag it to the tool box for later re-use. Darn near the same as having a control there. Oh, and after you add to the toolbox you can then rename the text snippet. Hi Santosh! We don't have an update yet. @ClintStLaurent 's post is a great workaround in the meantime.